For book club we read Mary, Martha and Me: Seeking the One Thing that is Needful by Camille Fronk Olson. The basic premise of the book is to look at the scriptural account when Jesus told Martha that Mary had chosen the good part (Luke 10:38-42). The author talks a lot about how women compare themselves to each other because they don't feel spiritual enough or that they aren't the best homemaker, mother, wife, etc. She uses the scripture passage to illustrate that what is most important is the we choose the good part - The Savior. I think what I liked most about the book was the appreciation I gained for Martha. Something that stood out to me when I re-read that passage of scripture was that the Savior says that Mary has chosen the good part - not the better part. Up until now I always thought that Mary was better because she was sitting at the feet of the Savior. When in reality that isn't the case. The scriptures never say that Martha didn't value the words of Jesus. 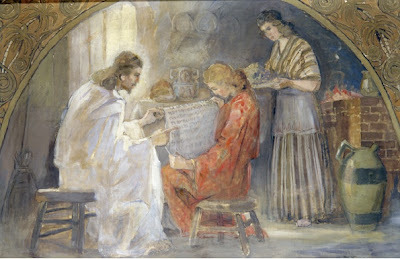 In fact that passage says that Martha "had a sister, called Mary, which also sat at Jesus' feet and heard his word." To me that indicates that Martha was a disciple of Christ and had listened to his words before. In fact I think the scriptures suggest that Martha really did understand the Savior and his mission. In John 11:20-29 Martha is the one who runs to the Savior seeking the his help after Lazarus had died. I really appreciate Martha and the way she lived her life (as far as we can tell from the scriptures). She appears to have been a multitasker, a hostess, a homemaker, a sister and a disciple who strived to keep the Savior at the center of all she did. Jesus' gentle reminder to choose the good part is one that I'm sure we can all hear every once in a while, especially when life gets busy. I like every so often to reflect on my life and the priorities that I have. Do I choose the good part? Is the Savior the center of my life? Do my actions reflect my testimony? I am grateful for opportunities to evaluate my life and the things I am doing and how they affect my relationship with Jesus Christ. I am thankful for the Atonement and the principle of repentance. I know that each day we can try to be better individuals and followers of Christ. I echo the testimony of Elder Jeffrey R. Holland. I know the Savior loves me and I am grateful for each day that I can strive to be more like him. If you have not watched this show yet this summer you are missing out! 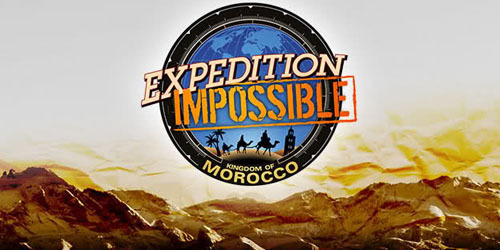 It is an extreme version of the Amazing Race. Do you love travel, adventure, challenges, drama, suspense and truly inspiring stories? If the answer is yes, then this is the show for you! The teams of three are crossing the surprisingly varied terrain of Morocco and doing some pretty intense challenges. The beginning episodes were fine but as the weaker teams have been sent home the episodes have really been exciting. The Fab 3 - for their endless supply of drama! Two gay guys with all their flare and a sibling rivalry....it doesn't get much better. The Gypsies - for their savvy travel ways and their mustaches! No Limits - for their mad skillz! They are consistently in the front of the pack and they have a blind man on their team plus other challenges that I won't reveal on my blog....but you have to watch them. They are incredible!